This DublSoft Toilet Tissue features the newly patented OptiCore two part core technology. 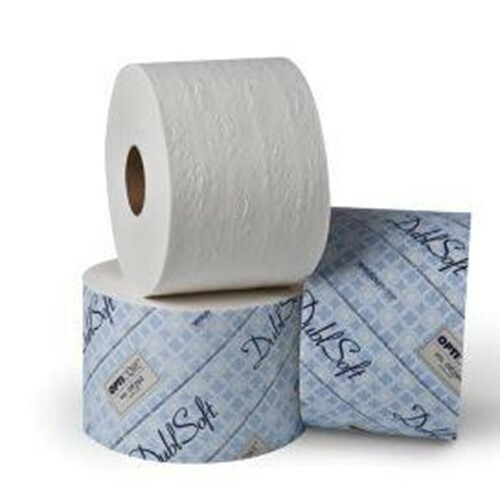 This DublSoft tissue, when combined with our new Revolutiont or Dubl Serv dispensing systems, ensures maximum use of each roll in the dispenser thereby reducing waste and cost. This premium tissue features a new attractive floral embossing pattern and is designed for those customers who demand the maximum in strength, brightness and softness. This tissue is ideal for office buildings, hotels and restaurants. Fits Dubl Serv dispensing systems that coordinate with OptiCore technology to provide controlled usage and cost savings. Sheet size: 3.75" X 4"
Case Size: 10"x 14.5"x 11.5"